The world's largest social networking site has a population nearly as large as China or India's. And the natives are getting restless. At 6 p.m. Taipei time on Friday, June 1, Ho Tsung-hsun was suddenly shut out of his Facebook account. When he tried to log back in, a message in a red box announced: "This account has been disabled." Ho, a veteran activist and citizen journalist on environmental and social issues in Taiwan, immediately took a picture of the message, then wrote an angry blog post on a Taiwan-based citizen journalism platform. He insisted that he had not violated any of the site’s community guidelines. Furthermore, he wrote, "the information I’ve collected and the Facebook groups that I’ve created and maintained all disappeared, which has caused inconvenience to my work and interpersonal relationships." Later that night, Ho’s account was restored — also without explanation. As it turned out, a number of Taiwanese politicians and activists had all experienced similar problems on the same day. Angered by what seemed like an act of arbitrary punishment against people who were not violating the site’s rules in any way that they themselves could discern, Taipei City Councilor Ho Zhi-Wei wrote an open letter to CEO Mark Zuckerberg, pointing out that Facebook — now a publicly listed company — "certainly has public responsibilities for public welfare." The incident underscored the extent to which people around the world have come to rely on Facebook for political activism and discourse — from the Green Movement in Iran, to revolutionaries in Egypt, to U.S. President Barack Obama’s re-election campaign. Facebook is not a physical country, but with 900 million users, its "population" comes third after China and India. It may not be able to tax or jail its inhabitants, but its executives, programmers, and engineers do exercise a form of governance over people’s online activities and identities. "To protect the millions of people who connect and share on Facebook every day, we have automated systems and a dedicated team that reviews reports made by users in order to maintain a trusted environment and protect the nearly billion people that use our site. In this instance, we mistakenly took action on a number of accounts and temporarily suspended them. When this happens, we try our best to resolve the situation, apologize to those affected and make any necessary changes to our processes to help prevent such mistakes happening again. We have already remediated the majority of these accounts, and expect to complete the process soon." That statement, however, was not posted anywhere on Facebook’s Site Governance page or other pages used for corporate announcements to users — nor was it sent to the users whose accounts were affected. Meanwhile, Ho in Taipei says that he received no explanation or apology. The problem is not new. In 2010 the Open Net Initiative, an organization dedicated to the study of Internet censorship worldwide, published a report titled "Policing Content in the Quasi-Public Sphere," documenting account deactivations and deletion of activists’ postings across many of the world’s most popular social media services, including numerous examples on Facebook. In Egypt on Nov. 24, 2010, the day before a long-planned Friday of protest against police brutality just months before the Tahrir Square demonstrations that brought down the Mubarak regime, the key Facebook page dedicated to organizing the protest disappeared from view. Its creators received a notice from Facebook staff that they had violated terms of service that require administrators of pages to use their real identities — and furthermore, that accounts of people not using their real names, when discovered, would be shut down. The page administrators, including Google executive Wael Ghonim, who was using Facebook under an alias in order to protect himself, were fortunate to have contacts in Silicon Valley and in U.S.-based human rights organizations, who negotiated with Facebook executives to get the page restored. But not all activists are so well-connected, and in many more cases, accounts remain intact but specific postings are blocked or deleted. In June 2011 the British singer-songwriter Billy Bragg complained that a link he had posted on his Facebook page connecting to the website of an organization called Oneworld Freedom for Palestine had been removed. As he wrote on the group’s page (which was also temporarily deactivated): "When I click on the link that I posted yesterday this is the message I got: ‘Sorry the link you are trying to visit has been reported as abusive by Facebook users’. I’d like to know what in the video was considered abusive and by whom." Incidents such as these inspired Palestinian activist Ramzi Jaber, a social entrepreneur in residence at Stanford, to create a new website, onlinecensorship.org, through which users of Facebook, Twitter, YouTube, Flickr and Google Plus can report on incidents of deletion and deactivation. The site is currently in final testing phases and will be launched to the public by the end of June, in hopes of holding social media companies like Facebook more accountable for the way in which they govern their services. Last year, when Jaber organized a TED-like conference in Ramallah, travel restrictions forced him to set up satellite events in Bethlehem, Beirut, and Amman, mediating the conversation between the three locations largely through social media. Through this experience, he came to realize how dependent the Palestinian diaspora has become on social media. "Social media has tremendous power for people to assert their voice, especially those who have been clamped down for the past 60 years," Jaber says. "This is a way of making sure that these networks, these private intermediaries, are held accountable and free speech is not suppressed." If enough Facebook users use his website to file reports when their accounts have been deactivated or content deleted, the scale and nature of the problem will become more clear to the public. The site could potentially be a powerful tool for activists seeking to push Facebook to improve its governance policies and mechanisms. On top of free-expression concerns, there are the thorny questions of privacy: What user information is collected and retained — and for how long? How and with whom is that information shared, and under what circumstances? How are people informed when Facebook decides to introduce new features or change settings that affect what others can see and share about them? Activists and privacy groups throughout the democratic world — particularly in Europe — have been using courts and political processes to push for stronger regulation and to ensure that privacy laws are enforced. One group, called Europe v. Facebook, has also experimented with grassroots activism among Facebook users themselves, taking concerns directly to Facebook management, using the website’s own organizing tools, in addition to lodging complaints with privacy commissioners in Dublin (where Facebook has its European headquarters) as well as the European Commission. There was another catch as well: According to the rules, if less than 30 percent of Facebook’s users voted, the results would only be considered "advisory." In the end, fewer than 350,000 users voted, less than 0.04 percent. Of those who did vote, 87 percent were against the new policy changes. On the Site Governance page, Facebook’s head of public policy and communications, CK Eliot Schrage, announced that due to the low turnout the changes would go ahead. Below his announcement, the comments section quickly filled with complaints from people who did not know about the vote until it had already closed, and who felt that Facebook had done a poor job of publicizing the vote to users. "Why not hold another vote, and this time, notify everyone who signs in to facebook at the top of their news feed about their opportunity to vote," wrote Maryland-based user Karen Collier. In a discussion about the vote on a page for people from all over the world who consider themselves "Digital Natives," Andrés Azpúrua from Caracas Venezuela wrote: "I knew about it, but not thanks to Facebook itself. They could have easily prompted every user once after logging in, and increased awareness with minimum invasion." Schrems’s response was scathing: "First they give you that whole speech about user participation, and then they hide the polling station, just to be sure. To us this is more of a Chinese than an American understanding of democracy." 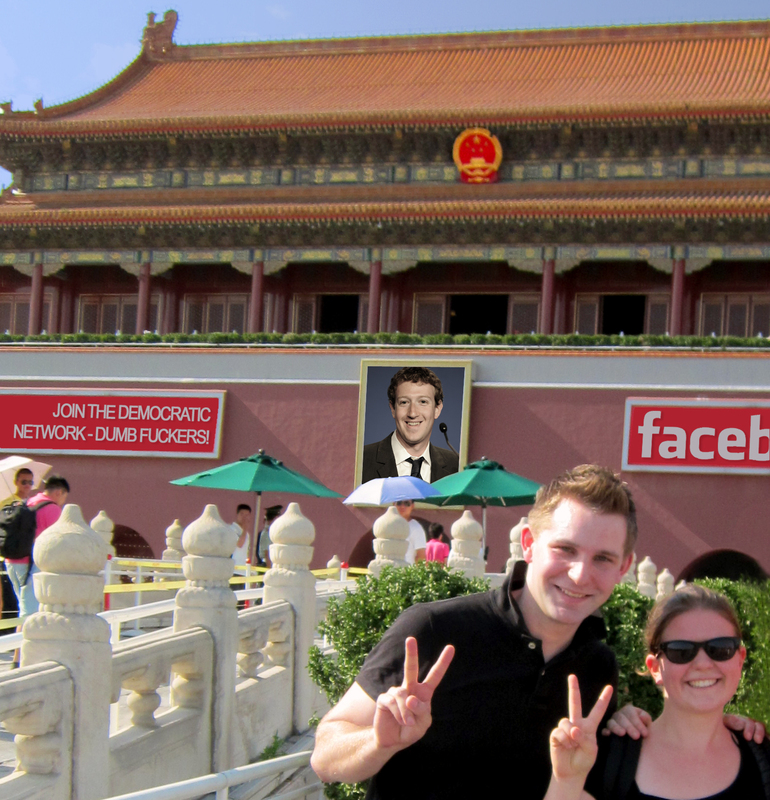 He even posted a Photoshopped image of himself in front of the Tiananmen gate, with Zuckerberg’s portrait hanging in Chairman Mao’s spot. More seriously, he intends to take his efforts to force Facebook to comply with Irish and European privacy laws all the way to the European Court of Justice if necessary. Europe v. Facebook has a list of objectives: transparency in terms of what happens to personal data; a requirement that data can’t be shared unless without explicit "opt-in" consent by the user; greater user control over what is shared and with whom; and minimization of the amount of data about users that Facebook keeps in storage for no clear reason. But Schrems and his allies — particularly numerous across the German-speaking Internet, where memories of surveillance under both the East German regime as well as the Nazis have made privacy concerns particularly acute — do not plan to stop with enforcement of existing law. Ultimately, they believe, Facebook’s excessive power over peoples’ digital lives can only be broken by a Europe-wide law requiring open technical standards for social networking platforms. What this would mean in practice is that a user of Google’s social networking service, Google Plus, or even a more obscure open-source non-profit platform like Diaspora, could communicate with her friends on Facebook without having to join it. Interoperability would give Internet users the freedom to choose services whose policies and practices they prefer without having to lose contact with friends who have made different choices. "This is very much in keeping with the EU philosophy," Schrems says, just as the EU has required that all rail, phone, electricity, gas, and other systems must be interoperable. "It would give other companies the opportunity to make money on social media," he argues, unlike the current situation in which "it is impossible for other companies to build up their user base because Facebook is closed, and everybody is dependent on Facebook for advertising." If enough people come to agree with Schrems, the phrase "Facebook revolution" could take on a whole new meaning.